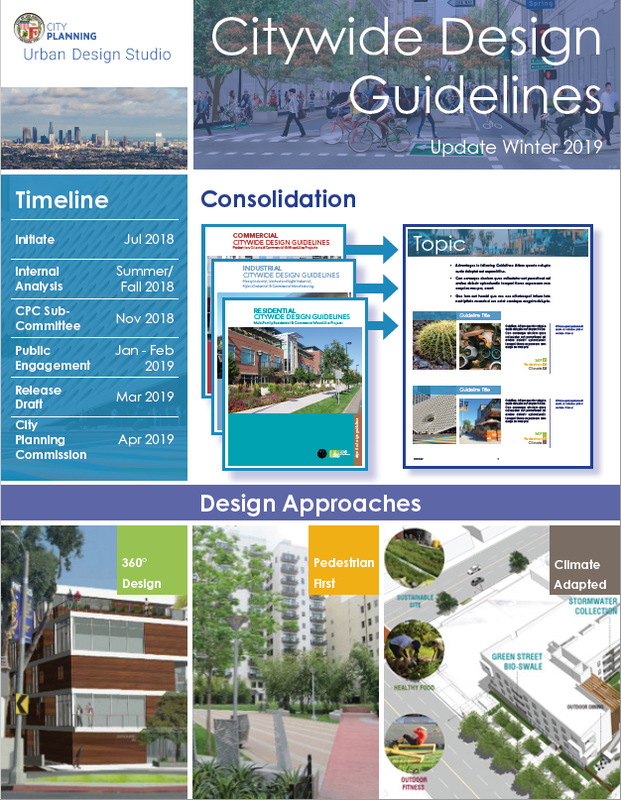 The Department of City Planning is updating its Citywide Design Guidelines and invites members of the planning and design community to share ideas on the range of topics that should be included in the update. The updated Guidelines are being organized around three spatial categories: site planning, building design and right-of-way. The guidelines are intended to assist projects in meeting the City’s three design approaches which include: Pedestrian First Design, 360 Degree Design and Climate Adapted Design. Light refreshments will be served. Doors will open at 6:00 PM, and discussion will begin at 6:30. RSVP is required. Please register by February 11. Los Angeles City Hall is served by Metro’s Red and Gold lines, and numerous regional bus lines. Parking is available at the Aiso Street Parking Garage, 101 Judge John Aiso St, Los Angeles, CA 90012.